A new countywide rail study could be on the horizon. Following an informal meeting with city, county and industry leaders Thursday, Jan. 17, to talk about countywide impacts from increased railroad usage, officials with the Port of Columbia County say they will begin exploring options to pursue a new rail study. Traffic and safety impacts related to rail shipments became a key talking point during recent public meetings, as port commissioners prepared to vote on allowing a wider variety of fuels to be transported via rail through Columbia County. Scappoose Mayor Scott Burge and St. Helens Mayor Rick Scholl both told port commissioners they worried about safety around schools, where hundreds of students cross railroad tracks. They also conveyed concerns over emergency responders often having to wait for passing trains to access patients in need. That same scenario played out the evening before Thursday's round-table discussion when an emergency responder notified a dispatcher she was "en route, but stuck waiting for a train." Burge and Scholl said their cities' concerns and requests for help were often ignored by railroad companies and the Oregon Department of Transportation's Rail Division. 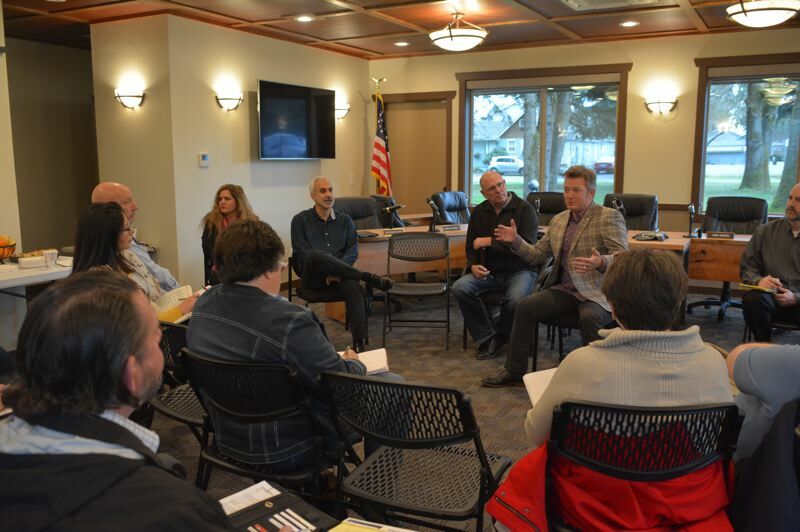 "It's an important mode of transportation, it gives us an economic development advantage, but if we could do so in a manner that gets us less impact on communities, it'd be a win-win," Scappoose City Manager Michael Sykes told port leaders during the port-hosted meeting. After hearing repeated concerns about the possibility of more unit trains blocking traffic to and from Highway 30, port officials convened a round-table discussion with key stakeholders. "We want businesses to thrive, we want increased rail, that's great, but ... we've got a problem to solve, and it's not going to go away; it's going to get worse," Port Commissioner Larry Ericksen said, noting an anticipated increase of 5,000 to 6,000 people in the Scappoose industrial area in coming years. Thursday's meeting was meant to be informal, including just over a dozen stakeholders and only one elected commissioner from Columbia County and one port commissioner. Nevertheless, the takeaway could be significant for municipalities in the county. "It sounds to me like we have consensus to at least explore the cost of a new study," Columbia County Commissioner Margaret Magruder concluded Thursday. Doug Hayes, executive director of the Port of Columbia County, said after hearing that rail studies done on behalf of the county were likely outdated, a new study could be funded with contributions from cities and key agencies in the area. it gets something on the books." "If this is something that we want to go forward, looking at a way to do this is, we put some bids out, find a way to do it, then once we get that dollar amount, we come back to all of you," Hayes said.